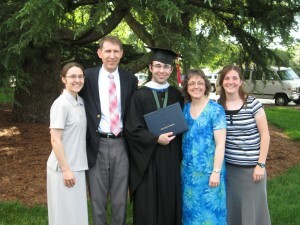 We are thankful that we could be present for Luke’s graduation from BJU on May 5. We actually arrived in Greenville, SC late Monday night (April 30). We spent time with our children, Luke and Rose, and enjoyed fellowship with many friends, former classmates, and acquaintances. It was hard to even walk on campus without meeting someone we knew! Being on campus and watching Luke march brought back so many memories of our own time at BJU. We thoroughly enjoyed our visit in Greenville. Luke will be attending the first session of summer school and working on campus. Then in June he will begin his new Graduate Assistant position in the Fundamentalism File in the BJU Mack Library. His graduate courses will begin in the fall. Rose will also be working on campus this summer. Please pray for them both. Marla, Beth and I have already begun our travels out West. We are thankful for a comfortable minivan to travel in. We are stopping with family along the way and reporting to supporting churches in the Phoenix area and in Northern California. Please pray for safety and blessing on our travels and ministry. We plan to spend about three weeks in California before heading on to Michigan where we will make our home base for the rest of our furlough. We should arrive in Michigan about July 2. Congrats Luke! That’s Awesome! Let us know when you guys are in the Detroit area. We would love to catch up.